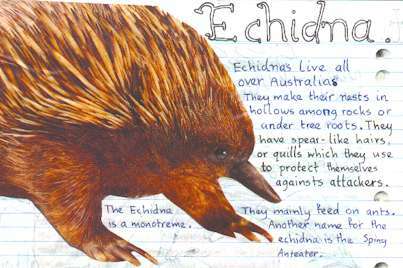 Echidnas are monotremes. There are two species of echidnas; the short-beaked echidna and the long-beaked echidna. They inhabit semi-desert to highland areas and eat ants, termites and earthworms. They have a black to brown coat, with paler coloured spines and can live up to 50 years in captivity. Echidnas lay eggs. It takes 10 days of incubation before the young hatch. Monotreme means 'one hole'. They have a single opening, not two, at the rear of the body. The spines are their protection, when an enemy comes echidnas roll into a ball and their spines stick out. Males have a horn-like spur on the ankle of the limbs, used when fighting. Echidnas have no teeth, but a long tongue made sticky with saliva. When they eat insects are crushed between spines at the tongue and the roof of the mouth. The short-beaked echidnas eat the ants and termites but the long-beaked echidnas feed mainly on the earthworms. The long-beaked echidna catches earthworms in spines that run in a grove in its tongue. It then draws the worms into its tiny mouth. The Long-beaked echidna is bigger than the short-beaked echidna which grow to about 50 cm long, and weigh up to 7kg. Echidnas are smart creatures and have been known to outperform cats in some tests.